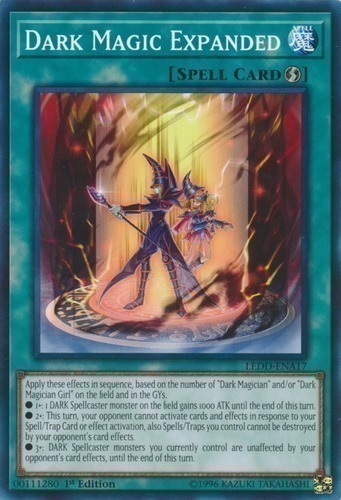 Apply these effects in sequence, based on the number of "Dark Magician" and/or "Dark Magician Girl" on the field and in the GYs. ● 1+: 1 DARK Spellcaster monster on the field gains 1000 ATK until the end of this turn. ● 2+: This turn, your opponent cannot activate cards and effects in response to your Spell/Trap Card or effect activation, also Spells/Traps you control cannot be destroyed by your opponent's card effects. ● 3+: DARK Spellcaster monsters you currently control are unaffected by your opponent's card effects, until the end of this turn.